“I think when we’re gonna be face to face and I start touching her, she’s gonna feel the difference,” Cyborg said. “I don’t think she ever fought somebody like me." At this point in the career of Cris Cyborg, the question marks aren’t about where she stands in the conversation of best female MMA fighter of all-time or who will be her greatest challenge in 2019 and beyond, but about motivation. Let’s face it, she’s done it all over the course of her nearly 14-year MMA career, winning titles in the UFC, Strikeforce and Invicta FC while beating a Who’s Who of the sport. But dominance comes with a price, and after she took a short-notice fight against former Invicta bantamweight champion Yana Kunitskaya in March and still dispatched her foe in less than four minutes, wondering how Cyborg will get out of bed in the morning and do roadwork or spend countless hours in the gym perfecting her craft had to be a concern for her legion of fans. As Cyborg recalls her visit to a children’s hospital in Brazil before her Octagon debut in 2016, it’s clear that her motivation to fight and succeed and set an example will never be an issue. On Episode 3 of UFC 232 Embedded, bantamweight champion Amanda Nunes and fiancée Nina Ansaroff arrive for their second fight week Christmas in Las Vegas. Featherweight champion Cris Cyborg spends Sunday at church, stopping for a photo op with Santa. Light heavyweight title challenger Alexander Gustafsson takes a helicopter tour of the Grand Canyon to break up the boredom of fight preparation, but when he lands, things are anything but boring as UFC President Dana White summons him to HQ with some shocking news about former light heavyweight champion Jon Jones. 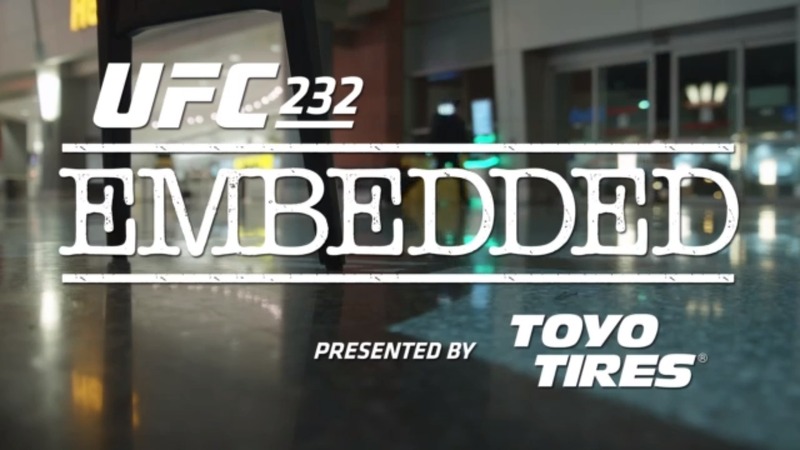 UFC 232 Embedded is an all-access, behind-the-scenes video blog leading up to the two massive title fights taking place Saturday, December 29th on Pay-Per-View. To the Curitiba native, being present for these children and giving them the inspiration to keep fighting is the true benefit of her championship status. And it extends far beyond the Octagon, whether she’s handing out food to the homeless in Los Angeles after the Kunitskaya fight or going on a missionary trip to Portugal. Yet as much as the 33-year-old is a shining example of the good folks in the sport, people heading to The Forum in Los Angeles this Saturday will be reminded just why Cyborg is seen by many as the most dominant female fighter of all-time. The fact alone that she accepted the challenge of women’s bantamweight champion Amanda Nunes for the UFC 232 co-main event speaks volumes, and it was a fight she agreed to as soon as “The Lioness” called for it. But as Cyborg points out, she was a little annoyed that the SuperFight has taken so long to get here. Cyborg smiles as she says this, well aware that there is no line outside the door of her California gym filled with opponents ready to challenge her. The fact that Nunes did has seemingly earned her a measure of the Curitiba native’s respect. Countdown goes inside the lives and the camps of the women's featherweights from UFC 232: Cris Cyborg and Amanda Nunes. That doesn’t mean Cyborg won’t be Cyborg when it’s time to throw down. “I think when we’re gonna be face to face and I start touching her, she’s gonna feel the difference,” she said. “I don’t think she ever fought somebody like me. Motivation? Yeah, Cyborg has plenty of it.